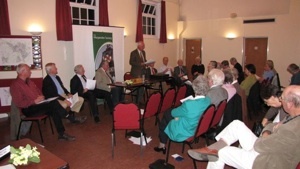 Members of the Harpenden Society met for their Annual General Meeting. It was the first one to be held since the chairman, Chris Marsden, was appointed on 31st March 2011. 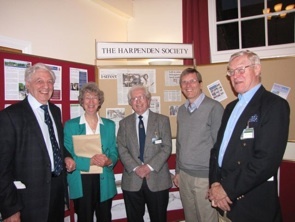 The Society is Harpenden’s Civic Society and was formed as a voluntary non-political body in 1930 to represent the needs and interests of Harpenden in a wide variety of areas that affect the lives of residents. It currently has just over 1,000 members. 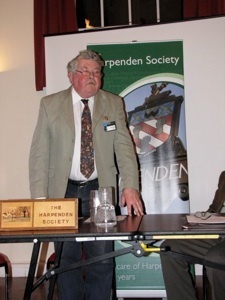 President Ian Fulton told the meeting that a short while ago the Society was not so well supported but he reported that the new chairman and the committee have addressed many important issues and he is delighted that the Society has been modernised and is now vigorous and thriving. Chairman Chris Marsden reported that when he took over the chairmanship he identified many good things about the Society including its history, the dedicated committee members, many loyal helpers and its good relationship with the Town and District councils. He also noted some problem areas and has taken steps to address them. Seven working groups have been set up to address the key areas of concern. Recent actions undertaken by the committees have included a membership drive, meetings targeted on the under 40s including the problem of school places for children starting their education. Other positive changes include a revived newsletter ‘Harpenden Society News’, an improved website and the appointment of a press officer. E-mail communication to members and committed has been enhanced. A number of promotional activities have been undertaken for example the awards given to honour worthy building and improvement projects. Five Public Meetings open to all were held over the last six months covering community and social identity, local prisons, Batford Springs Nature Reserve and the new planning environment and school places. 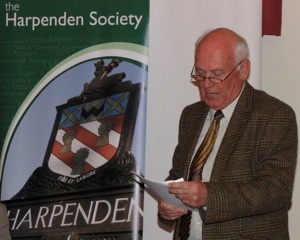 The chairman undertook a survey of Harpenden Businesses to assess their social responsibility and how they contributed to the life of the town. This shows that businesses makes a huge contribution to the well-being of our Town and its people. This is an ongoing project. The chairman ended his report with outlining how the Society has contributed to the Neighbourhood Plan. Constructive meetings have been held with the Town, District and County Councillors. A wish list of things the Society would like to see happen in the Town, in both the near and more distant future, is being drawn up with inputs requested from members and other residents. Chris Marsden (above) and Ian Fulton (below) addressing the meeting. 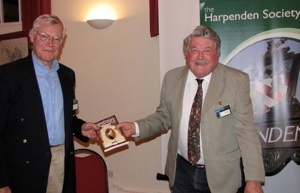 Above - Richard Thomas (left) presented retiring President Ian Fulton with a copy of the Local History Society’s recently published book Theodora’s Journals. Below - Committee members at the AGM.